One day I will own a Chanel jacket. As you may or may not know, this runs the pocketbook about $7k , but if you’ve ever held a Chanel jacket in your hands, you’ll know why it takes 100 couture hours to make. Enter Tatiana Resale Boutique, one of the best connected NYC resale boutiques on the planet (self-described as: “high fashion at low cost.”) Sounds promising, right? And the good news is that you don’t have to live in NYC to take advantage of Tatiana’s stock. You can find it at my favorite designer den, e-bay: http://stores.ebay.com/Tatiana-Designer-Resale. If you see a Chanel jacket, I’m size 4. • Rhinestones, tear drop shaped glass beads and some type of plastic beads. Vintage beads work best however, if you can’t find those, any beads from the craft store will work (they need to be round like a doughnut). • Little wooden box (I found mine at the dollar store). They have these at any craft store. It does not matter what size. Mine measures 4” x 4”. • Hot glue gun and hot glue sticks. First: You have to paint your little box. Choose whatever color you like best. I painted my box a darker blue color and went over it with a lighter blue. Once the lighter blue was painted on, I took a paper towel and blotted the paint. This gives the box a bit of a weathered look. It turned out really nicely. Second: You will take your little plastic doughnut beads and space them out on the top of the box before gluing them down. This will give you an idea of how many beads you will need for your box. Then you will glue those on with the hot glue gun one by one. This is a very tedious process however it’s the only way to do it. You will want to repeat this step on the top of each side as well. Once the doughnut beads have been added, you will glue on your rhinestones one by one. Again, this is a very tedious process but it’s the only way to do it. 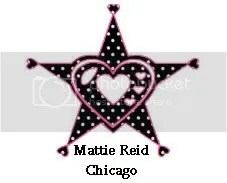 You can find this box and many other handcrafted items at www.mattiereidchicago.com or http://mattiereidchicago.etsy.com. You can also click on the banner below. The U.K. is such a style hotspot these days, and I’m always looking for a fab indie pipeline. She’s A Betty hits the spot, self-described as a blog for women with a focus on vintage & DIY fashion, indie & budget style. Sounds very familiar, kind of like She’s a Betty and Athena were separated at birth or something. (Well, Athena may be the more bookish, stay-at-home type, while Betty is an about-town party girl.) So even though She’s a Betty is a blog, if she were a girl, she’d be my best friend.